The reality of the built environment for disabled people is one of social, physical and attitudinal barriers which prevent their ease of mobility, movement and access. In the United Kingdom, most homes cannot be accessed by wheelchair, while accessible transport is the exception rather than the rule. Pavements are littered with street furniture, while most public and commercial buildings provide few design features to permit disabled people ease of access. Inclusive Design is a documentation of the attitudes, values and practices of property professionals, including developers, surveyors and architects, in responding to the building needs of disabled people. 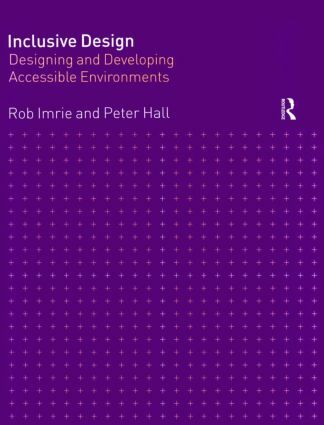 It looks at the way in which pressure for accessible building design is influencing the policies and practices of property companies and professionals, with a primary focus on commercial developments in the UK. The book also provides comments on, and references to, other countries, particularly Sweden, New Zealand, and the USA.